In addition to over 100 new maze layouts, many ramdomizing maze features have been included to provide further variety for players. There are several new features and hidden strategies to be found in each maze. 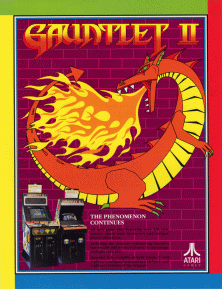 Players will especially like the additional game play objective of Gauntlet II's Secret Rooms. By completing a special secret trick a player is allowed to enter the Secret Room (the other players in the game are temporarily suspended from play). If he completes the task he is given, the player is rewarded with a large bonus score as well as permanent potions and food. All of the original Gauntlet opponents remain with the addition of many new creatures. Among the newest adversaries is the Dragon. The fire-breathing Dragon is found guardinf the exit to the maze and requires several direct hits to overcome. By slaying the Dragon players are rewarded with a permanent potion and a bag of treasure. At the start of teh next maze zhere will be a hint on how to find the Secret Room. Players will find several new potions to collect as well as all of the original potions. Experience will ell the player which potions provide the greatest advantage; some potions may not be beneficial depending on the situation. On Gauntlet II, a player can now choose his favorite original Gauntlet character even if that hero is already in play. The four characters are color coded so there can be as many as four Warriors (or any other original character) in play at the same time.